Red Sox broadcaster Don Orsillo preparing his chicken and sausage dish. Orsillo’s family tomato sauce recipe. SMITHFIELD, R.I. — Don Orsillo has been the television play-by-play voice of Red Sox Nation since 2001, riding the highs and lows of the team’s fortunes with unshakable calm, earning the respect of his peers in the industry, and having a ball with his on-air partner, former Red Sox second baseman Jerry Remy. Dad can rest assured. His son merely tantalizes us with its aroma and taste. A baseball player through high school in Madison, N.H., Orsillo saw his playing days end at graduation when he realized that he would have to find another route to the major leagues. He used to listen to Ken Coleman and Joe Castiglione call Red Sox games on the radio. “I thought it was the coolest job ever,” says Orsillo. At Northeastern, he interned for the pair, which reaffirmed his career choice. After college, he spent 10 years broadcasting in the minor leagues before getting tapped by NESN in 2001. 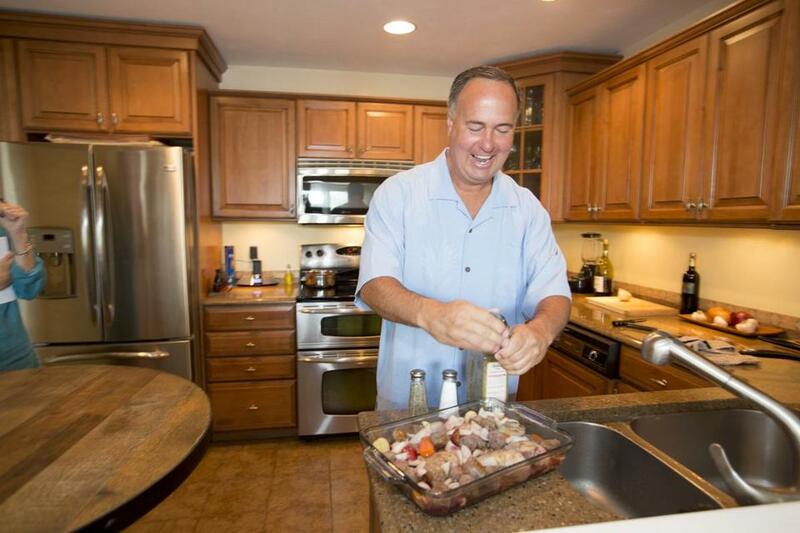 Inspired by his father, who the son says is also adept in the kitchen, Orsillo began cooking for himself in college. 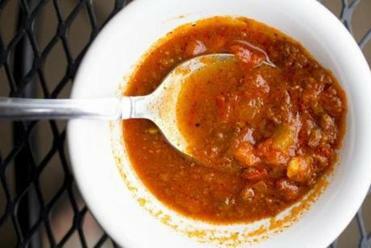 Rather than relying on recipes, he says, “I wing it a lot, but I also watch the Food Network a lot.” He is a fan of Anthony Bourdain, trying to re-create dishes featured on his travel shows. And he attempts to reverse-engineer items he enjoys at restaurants. When traveling with the Red Sox, Orsillo says there is usually at least one day game, which means he’s free for dinner afterward. Favorite dining cities include Toronto, New York (“of course”), and Philadelphia. He enjoys barbecue in Texas and Kansas City, and appreciates the different styles of the cuisine in each city he visits. Orsillo’s chicken and sausage dish. Today, the broadcaster is preparing chicken and sausages in red wine sauce. Chicken drumsticks brown in one skillet, sausages in another. 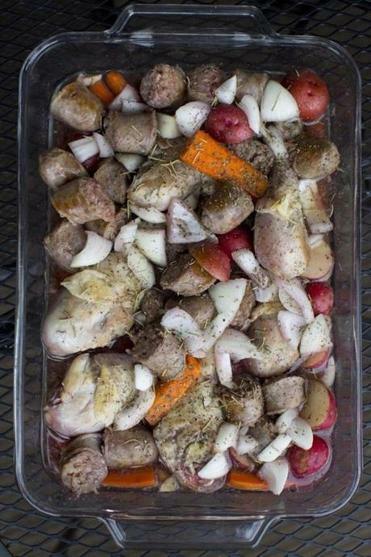 Orsillo roughly chops potatoes, carrots, onions, and garlic and spreads them in a glass baking pan. Donatangelo’s sauce, prepared earlier in the day, simmers on the stovetop, taunting with its mysterious ingredients. Later, he’ll serve it over pasta. Orsillo will only reveal that it contains four kinds of meat, fresh tomatoes, and takes three days to prepare. He makes at least three big batches each year — one in Florida that lasts the duration of spring training — and freezes them in Ball jars. While he cuts vegetables, Orsillo tells of a grocery shopping spree in Rome, with his father’s wife’s mother, who speaks no English; Orsillo speaks no Italian. They were buying ingredients for the dish Orsillo is making today. Garlic is stronger in Italy, so he learned to cook with half as much; and the chicken has a different density, he says, so takes longer to cook. Working in an unfamiliar setting, with these ingredients, he was afraid the vegetables would be ruined by the time the chicken was done, but his Italian family pronounced everything delicious. “This is the first dish I’ve ever made for Romans that Romans actually liked,” he says. In his own kitchen, with all the garlic he’s accustomed to using, and chicken from his local market, it’s pretty spectacular, too.